Tap into your user’s out-of-app mobile data to create on-point campaigns and reach maximum engagement by using Blinnk’s unique behavioral insights, unrivaled segmentations, and more. Tap into your users’ out-of-app mobile data for unique behavioral insights, powerful segmentation, and maximum engagement. If you think in terms of your "in-app" data share, you get just a sliver of users' time. And from that tiny window, you have to capture a full picture of their mobile behavior. 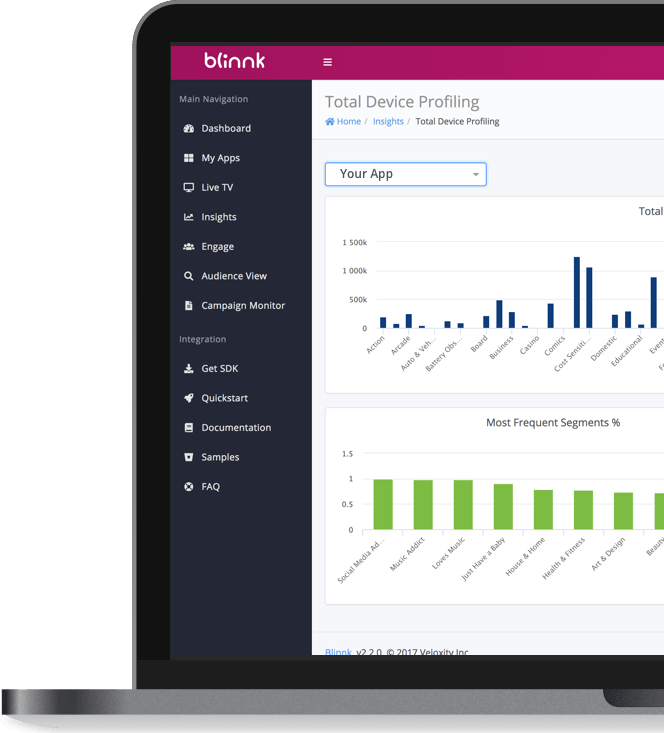 Blinnk helps you analyze user behavior far beyond your app. It allows you to access and use device-based, "out-of-app" data. Copyright © 2017 Veloxity Inc. All rights reserved.